ASEcoLi has helped the Europäisches Haus Pappenheim (EHP) in developing the Language Emergency Doctor method (in German: Sprach-Not-Arzt), an innovative method with which you can teach German to migrants and refugees with no prior knowledge basic communicative skills for their new life within just a few days. The teaching material for adults has appeared as ASEcoLi Publications by the Academy for SocioEconomic Linguistics 6. A number of EHP Newsletters have already reported on the method and the courses. The principles can also be transposed to teaching other languages to beginners. ASEcoLi has helped the Europäisches Haus Pappenheim (EHP) in developing the Language Workout Method, an innovative method with which you can learn, within just two half-days, the basics of a European language for the most important siutations as a tourist. 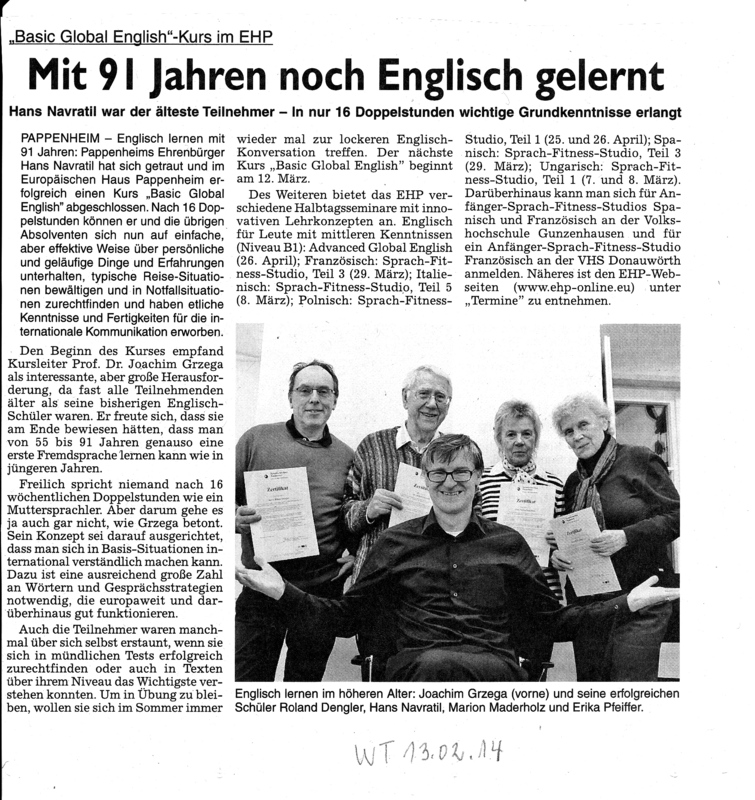 A number of EHP Newsletters have already reported on the method and the courses, which are called LanguageGyms (in German: SprachFitnessStudios). We are proud of the oldest BGE student, who has successfully completed a BGE course at the EHP and also managed to lead classroom phases according to LdL. Here is the EHP newsletter entry. Last Saturday we celebrated 30 years of LdL at the Europäisches Haus Pappenheim (EHP). The celebration included the presentation of the new LdL book by Bea Klüsener and me. 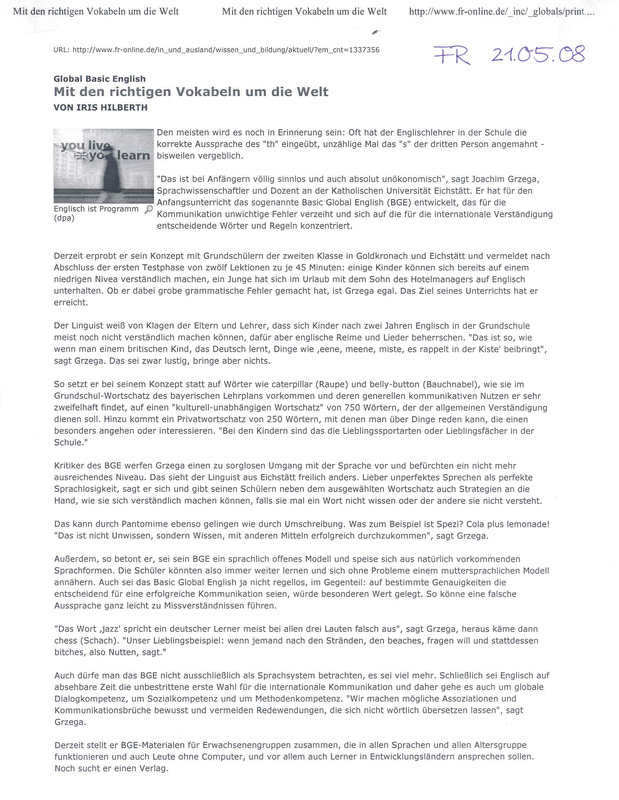 Here are press releases from Der Skribent and Weißenburger Tagblatt. The LdL website is currently hosted by ASEcoLi. While skills in French are relatively widespread in Germany, Hungarian is a hardly studied language here. Due to the partnership between Pappenheim and Iszkaszentgyörgy, to be officially started at the weekend of the EHP opening, the EHP is therefore offering in cooperation with ASEcoLi learning material, developed by myself for the first encounters with Hungarians. The innovative study concept was already tested by students. It consists of a little textbook and 99 audio files that are freely downloadable at ASEcoLi or via the EHP website. The concept consists of 4 phases and uses the German language as an aid for learning the words and structures and offers memory hooks. For those of you who are interested in LdL (= Lernen durch Lehren = Learning by Teaching). There will a 30-Year Anniversary Celebration on 8 December 2012 at the Europäisches Haus Pappenheim. It will include a presentation of the latest publication on LdL (by Bea Klüsener and myself), but the organizing team is also open for additional suggestions (e.g. a workshop). If you have any suggestions, please e-mail them to me at grzega@pappenheim.de by September 4. International guests are most welcome. Contact me to check whether there are any chances for funding travel expenses. When discussing the idea of a European municipal project on the connotations of words, contacts of the Europäisches Haus Pappenheim showed much interest in the concept of Basic Global English. It seems that among the “middle” and “elder” generation, English is much less known that the EHP had expected. Therefore, an additional preparatory phase has now been implemented in the project plan. ASEcoLi is now cooperating with Europäisches Haus Pappenheim (European House Pappenheim) (EHP) , a new center of research, education and political discourse.